Nice ep, like the deep rave style of Munch Munch. I’ll try out Munch Munch. Character tune..! Will download. Thank you for good music! Really enjoying this whole release! Bonus for amazing cover art! “Munch Munch” an absolut freaky dip…100% for me. Nice EP! 3 beautiful tracks. i love the atmosphere in deeplodocus. thank you! Great release once again! I love it. “Deeplodocus” for me… love it! Deep house wird great spirit! my fav Munch Munch. Crazy pack! Cherries blows me away! Cherries and Deeplodocus are both nice tracks. Another lovely release, will play out! Cool deep release again. Cherries and Munch Munch for me! Cherries for me, I love it! Thanks Guys! Wie erwartet tolle EP auf Steyoyoke!!! THX und weiter so…..
Loving Cherries & Deeplodocus, thanks! Really like Deeplodocus ta… not neccessarily my first grabber for a party set but just a great piece of original sounding and forward thinking music…cheers! It’s a wicked style! I ll work with the deepest one: deeplodocus, thx! Another outstanding release on Steyoyoke! All three cuts really deliver; Cherries is melodic house at its finest, Deeplodocus is glorious deep & warm in exactly the right way, while Munch Munch is an absolute dancefloor cracker. Love it! This label is growing on me! Gonna try the tracks on Saturday. Cherries is great. Munch Munch is a bit crazy but nice. Will try deeplodocus in my set! Cherries track sounds like CHERRY ON TOP …Very nice! Great EP! Deeplodocus and Munch Munch being my prefered tracks, will play both out! Thanks! Munch Munch for me. some really interest rave sounds inside! “In the space of five releases, Berlin’s Steyokoke have quickly earned a reputation for delivering gold-standard house with a twist. Bartok doesn’t come in any danger of sullying it with the three beautifully balanced, if slightly paranoiac, offerings on Deeplodocus. Percolating Tangerine Dream synths, a jackhammer bassline and a faintly pervy vocal (a bit like those scary text-reading voices you get on Apple Macs) are the headlines on “Cherries.” They make for a malevolent, mid-tempo cruise with a pleasing lack of fluff about it. “Beats aus dem Tithonium. Heute kam die neue EP von Bartok heraus. Die Platte ist mehr oder weniger nach einem Saurier benannt, trifft aber definitiv einen sehr zeitgenössischen Klang. “Da ist die neue Veröffentlichung des jungen Berliner Labels Steyoyoke, welches immer wieder durch den einen oder anderen Kracher auf sich aufmerksam macht. Bartoks Release Deeplodocus stellt für mich wieder so ein Kracher Release dar. Die drei Original Tracks schaffen es ohne zusätzliche Verschönerungshilfe durch eingeladene Remixer sofort ins Ohr zu gehen und sich dort festzusetzen. 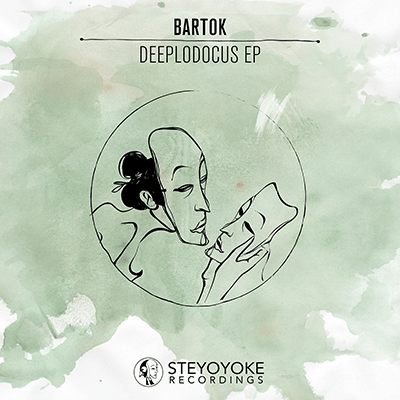 “Steyoyoke delivers another charismatic affair for the labels fifth release with Bartokʼs three track EP entitled “Deeplodocus”. Brimming with diversity, Bartokʼs EP runs the gamut of deep, to funky, to ambient, to big room sounds. His versatile, well rounded production skills are manifested throughout, pushing the envelope with genre bending beats that have been crafted with beautiful restraint, all the while delivering big-room sounds that will keep you dancing into the late summer nights. © 2019 Fuony Agency. All Rights Reserved.